The tweet-ups began early in January when I met @kenwilsonlondon(and his wonderful wife Dede) in London. Merry Christmas to all the visitors of my blog! May your holidays be filled with joy, peace and love. Greetings From The World is the winner! Huge congrats toViviana, Rose, Eva, Culya, Judy, Clara V., Clara G., , Shyam, Vicki, Gyöngyi, Jesstern, José, Candace, Valerie, Monika, Shannon, Heidi, Dan and Claudia. It's because of you and your wonderful students. Quite a few members of my PLN spent the last weekend at a conference in Paris. I couldn't be there with them, (I strongly believe the time will come when I too will go to a conference and meet my PLN:-) but now I'm enjoying reading their reflections on their very special tweet-ups and the fabulous TESOL conference. One of the brilliant presenters and speakers at the conference was David Crystal. This weekend, imagine that, I had a fantastic opportunity to hear David Crystal give two talks at the 10th OUP Conference in Zagreb: Advanced Conversational English: fact and fiction and The perils of being a linguist. David Crystal held his audience of about 400 (or maybe even 500) teachers enthralled for over two hours. David Crystal didn't use power point. He didn't need it. His speech was powerful without it. On December 1, 2009 an ICT teacher, a math teacher and an English teacher launched a website for their school-leavers with nothing but boundless enthusiasm. The website contained links to free exercises on the Internet as well as interactive exercises created by the above said teachers for their students. They also created a facebook fan page, a ning site and a twitter account for the website. The word about this free site for online preparation for the standardized school-leaving exam spread incredibly quickly all around the country. The website is no longer the place to practise writing, reading and listening skills, math and ICT for the students from one school only. It is THE place where school-leavers from the most southern island to the most northern village can get ready for their exams, provided they have internet access. And they do - in their schools if not in their homes. 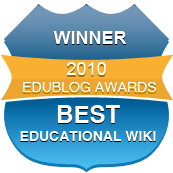 This time last year I was beside myself when I heard that my wiki Greetings from the world was shortlisted for the Best Educational Wiki Award. And I will never forget the wee hours of one Friday in December when the winners were announced. Just don't ask me what I said in my winner speech. That I don't remember. 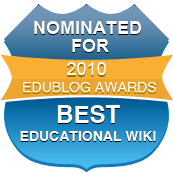 Best new blog: Webb's Wide World by Jan Webb.